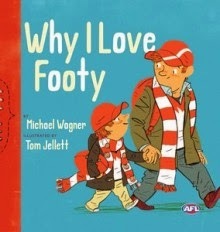 This is a picture book for all young lovers of Aussie Rules football, told from the perspective of a boy who is a big football fan. As far as he’s concerned there are a bazillion reasons to love footy! The boy, who is never named, gets ready to go with his family to watch his favourite team play live. He wears all his footy gear (jumper, hat and scarf) and travels on the train to the football ground with a bunch of other fans. There’s a great bird’s-eye view illustration of the ground to explore, with all the key positions marked. Many aspects of a football game are covered, including the mascot (another fun picture with lots of the AFL mascots featured), half-time snacks (like hot chips! ), tackling, goal kicking and specky marks! It’s a nerve-wracking experience for the fans waiting to see who will win a close game, and at the end they enjoy singing the club song together and having a kick around themselves. Once at home the boy gets out his football cards and watches the game again, this time on TV. And in bed that night he even dreams about footy and growing up to be a star player. The boy’s favourite team is the Sydney Swans, but all teams are featured in one way or another, including the endpapers which are a collage of the different team scarves. A story full of enthusiasm for football and being a good sportsman.